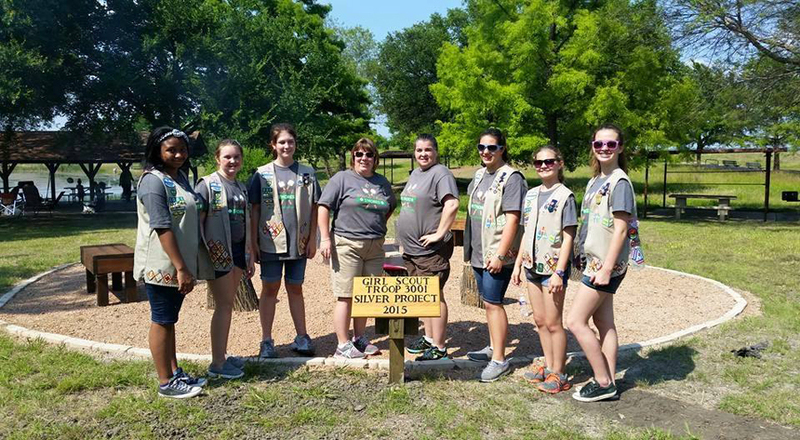 Girl Scout Troop 3001 worked for approximately 50 hours planning and construct- ing a new fire pit at Brockdale Park. Pictured from left are Jasmin White, Car- rie Dobbs, Amber Brockman, Melanie Wied (troop leader), Laura Dobbs (troop co-leader), Maddison Wied, McKenzie Todd, and Kaytie Cooke. Not pictured is Victoria Cambell. Girl Scouts Troop 3001 took a traditional summertime treat, smores, to a new level, making it easier than ever for community members to enjoy. The troop built a fire pit, perfect for smores making, at Brockdale Park located on the edge of Lake Lavon, as part of their Silver Award project. The Silver Award is the highest award any Girl Scout Cadette can earn. The troop began by digging the ground up, clearing the area of old weeds and laying down old cookie boxes to keep the weeds from growing back. Next, they put a layer of dirt and gravel down before they installed the fire pit and put the logs in place. The troop made a plaque and provided a bench. The Silver Award project is a 50 hour commitment. Recipients must identify an issue; build a Girl Scout Silver Award team or decide to go solo; explore their community; pick their Silver Award project, which must be done in the local community; develop the project; make a plan and put it into motion and reflect, share the story, and celebrate. The troop includes Jasmin White, Carrie Dobbs, Amber Brockman, Melanie Wied (troop leader), Laura Dobbs (troop co-leader), Maddison Wied, McKenzie Todd, Kaytie Cooke and Victoria Cambell.